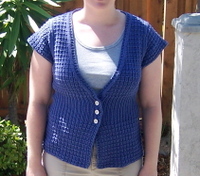 Pattern: Cap Sleeved V-Neck Vest #24 from Tahki Yarns Spring/Summer 2007 Collection. Yarn: Lion Brand Cotton Ease, violet. Used four skeins. Needles: Addi Turbos Circs US7s and US5s (ribbing). Impressions: I really like this tunic. 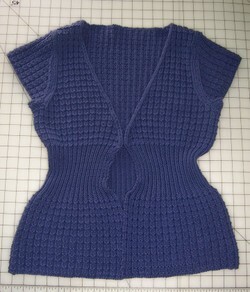 It was a pretty easy pattern, and a great "mind-less" knit. The pattern is well written and easy to follow. 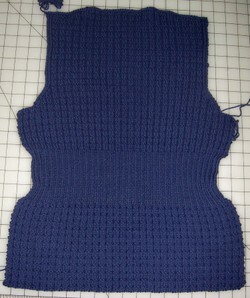 I was a little worried that the sleeve edges might be too big, but it ended up not being a problem. It fits really well! 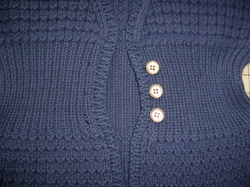 All that is left is to sew on those buttons! Yea! That's going to take quite a bit of effort. I'm almost wondering if there is a way to crochet ribbing stitches or if picking up stitches and knitting it is my only option. 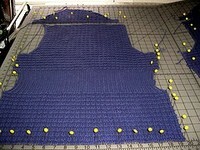 I know crochet would go much faster... but will I be sacrificing the design? Hmmm, something to think about. It is beyond me why he has chosen to make that his spot considering he has the whole cutting table to his disposal! Including a different spot right in front of the open window. 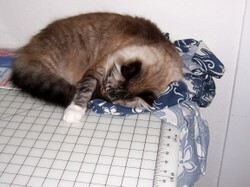 Oh well, I may have to re-wash the fabric, but it made for quite a bit of cuteness on his part! After some drying... and some seaming... 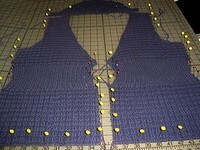 I have some 250+ stitches to pick up along the front and neck edges for a few rows of ribbing. It is doubtful that I will get it completed before the end of the week with drying time and all... but the San Diego Chargers do have their first pre-season game on Sunday night, so maybe, just maybe, I'll be able to make some good progress on it then. In the meantime, while the v-neck was visiting the blocking board last night, I picked up the front piece of DH's Tribal Sweater. I made some good headway - only twelve rows of intarsia charting left, then it speedy knitting into the remaining stockinette and neck/shoulder shaping! 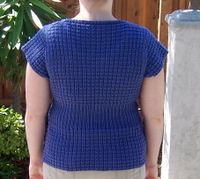 This puppy needs quite a bit of blocking, it looks so wonky in the picture. 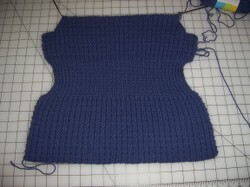 Instead of binding off for the shoulder/neck shaping, I decided to use short rows. I love this technique, but it was definitely challenging in this stitch pattern. 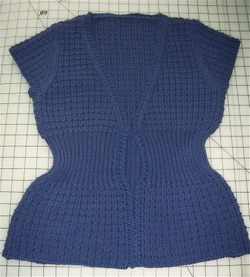 In wanting to keep the stitch pattern as correct as possible, I re-knit this shaping some three times. But it was worth it.